EMPOWER is a workshop series that seeks to provide teachers the opportunity to learn more about modern teaching methodologies and practices. It is a comprehensive range of programs designed to address various topical and relevant needs for teacher development. 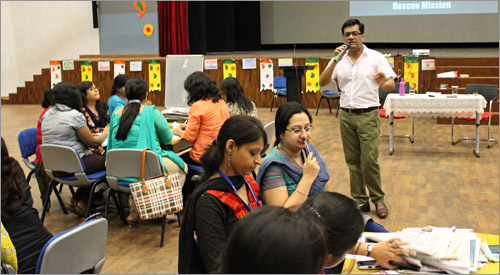 The annual calendar of workshops covers many topics of interest for teachers at all levels and provides schools an effective medium for their teachers to attain additional learning and exposure. These workshops fulfill the pressing need for regular teacher training that many School Leaders and Heads have. The absence of purposeful and regular training interventions or professional development options have often led to stagnant skill levels and lower motivation amongst teachers. This obviously reflects in the teaching and learning practices in their schools and affects the long term growth of the institution, and more importantly, the development of the learners. Currently the Empower series of workshops are only being offered at the group headquarters in Kolkata. Schools and teachers may ask for the current schedule.